HIBS players and fans who were killed in the Gretna rail disaster are set to be honoured at a special ceremony. Club representatives will lay a wreath at Rosebank Cemetery, where most of those killed are buried in a mass grave, on Saturday morning. Easter Road will then fall silent ahead of Saturday’s key play-off clash against Rangers at midday as both clubs pay tribute to the soldiers from the 1/7th (Leith) Battalion, the Royal Scots, who lost their lives in the tragedy 100 years ago. It is not known for sure how many Hibs players were caught up in the crash but some believe it may have been up to eight. Leeann Dempster, the club’s chief executive, said it was important that Hibs played a part in the remembrance services. 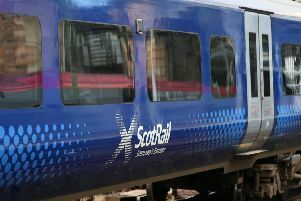 She said: “The majority of young people on the train were from the Leith area, and a great many of them will have been Hibernian supporters or had strong connections to the club. The impact on the community of Leith and further afield of the tragic events was enormous, with so many families touched. “It is right that we all join together to remember them. A military parade will leave the Dalmeny Street Drill Hall at 10.15am on Saturday, before making its way to the cemetery along the route taken by the original funeral cortege. The 11am service, attended by the Princess Royal, will be screened live on giant screens to neighbouring Pilrig Park. Ahead of the event, historian Trevor Royle, who sits on the commemorations panel appointed to oversee Scotland’s First World War commemorations, met Hibs captain Liam Craig to help lay a plaque at Easter Road in memory of the players and supporters who died during the First World War. Mr Royle said: “Hibernian FC plays an important role in the community of Leith which was so hard hit by the Quintinshill disaster. “While many feared their loves ones going off to war, little did they know that tragedy would lie so close to home. On May 22, 1915 a train carrying 498 members of the 1/7th (Leith) Battalion, the Royal Scots, collided head-on with a passenger train parked at Quintinshill, north of Gretna. The carriages overturned on to the north-bound main line and a minute later the Glasgow-bound express ploughed into the wreckage, causing it to burst into flames. A total of 216 soldiers from the battalion died on the train which had been carrying soldiers to Liverpool to embark for Gallipoli.